Supreme Air provides Air Conditioning, Heating and Plumbing Services, Repair, Installation, Maintenance, and Tune Up in Nottingham, MD and surrounding areas. Daniel, the technician arrived early, completed the check up quickly and provided useful information about the care of our HVAC system. Thank you Michal, we're so pleased to hear back from you about how your check up went. Daniel certainly is efficient and enjoys sharing his knowledge with our customers to help them care for their system. We're looking forward to your next check up during the heating system. Have a supreme day! Performed maintenece on all 3 units. Cleaned condenser coils. Inspected Evap coils and blowers. Cleaned out all drains. Tested split condensate pump. Checked contactors and capacitors. Tightened electrical connections. Ran ac on all units. Checked delta air temps and amp draw. Outdoor temp is 50 degrees so couldnâ€™t get a great idea on the refrigerant circuit and how it is operating but ac units seem to be working normally with good delta air temps. 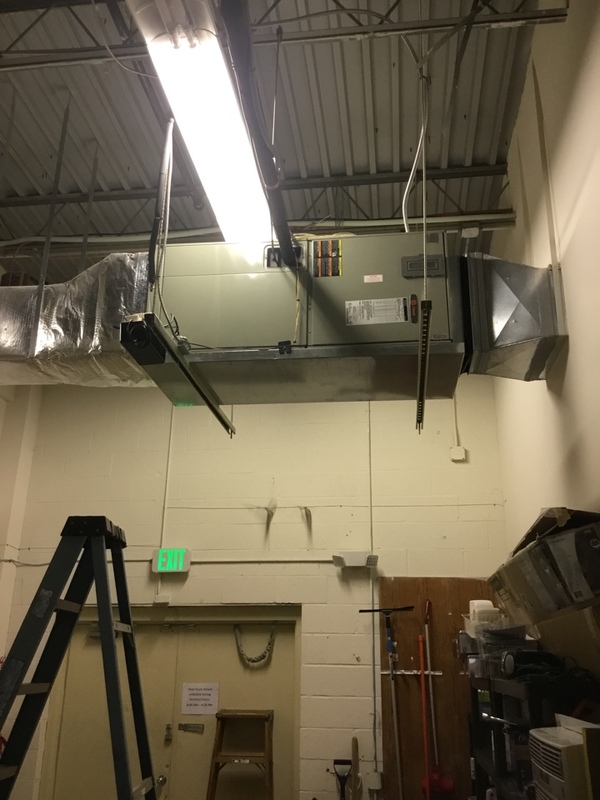 Suggesting customer get both rooftop units replaced because they are 30+ years old and could perform better and run more efficiently with newer equipment. Unit 1 has Electric Heat only, not a HeatPump. I replaced the defrost sensor and the defrost control board. I added just over 1lb of r410a to have operation pressures match data plate. Last time I was here I leaked all fittings and confirmed that there are no system leaks. Unit operating normal. Coil sensor is faulty and not closing. Heat pump froze up severely several times. I did force defrost and after that the refrigerant pressures were normal and temperature rise was 24-26 degrees. I think itâ€™s best to replace the defrost board and sensors together and called the service manager. I completed a parts order form. I replaced the heater pack and installed the breakers it came with. I checked the unit for proper operation. Unit operating normal. Customer owes no more for this repair once the previous payment of $440 is applied to the balance. I told customer I will come back on April 9th at 3pm as a courtesy to check the unit in ac mode. I will let the office know to set time for this. Heater kit needs to be replaced. There is a short somewhere within the 60 amp side. I removed the wires to the 2 elements served by the 60 amp side so that the board still has power but the fuses will not be able to blow. It is of course only heating on heat pump heating and 5 kw of auxiliary heat. Customer approved the repair to replace the heater kit and per Alex, I credited back the amount paid previously. I filled out a parts order form and sent it to the person in the office to order tomorrow. Please reach out to the customer with availability. Replace blown 60 amp fuse and test the system. I replaced the blown 60 amp bullet fuse and tested the unit. Refrigerant pressures were normal for very low outdoor temperature. Auxiliary heat came on and was pulling normal amps. The unit is operating normal. Customer declined service membership due to them moving from the home soon. No AC on a Trane split system in White Marsh ,MD.